Are you a content vendor or perhaps an organisation with a plethora of LMS platforms where managing content is cumbersome? Or maybe you are looking to improve the hosting and performance of your elearning content within your LMS? If you can answer yes to any of these questions, then the JZero Content Cloud is the solution you are looking for. The JZero Content Cloud is a Content-as-a-Service platform which allows you to upload your SCORM or xAPI (Tin Can) courses and generate Accelerated SCORM packages which can then be imported into your LMS. So rather than hosting your courses directly within an LMS, they are hosted on the JZero Content Cloud, giving you more control and flexibility. 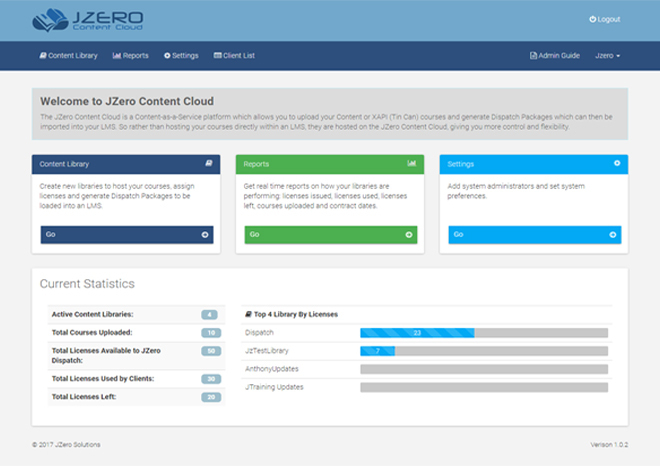 So what are the benefits to me for hosting my elearning courses on JZero Content Cloud? For each small version update, the whole package needs to be updated within every LMS that it resides. Using Accelerated SCORM packages, the original course needs to be updated just once on JZero Content Cloud only and all LMS platforms using the Accelerated SCORM package will see updates automatically. As course updating is done at the LMS, content vendors can never be sure whether each LMS is using latest course or not. Using Accelerated SCORM packages, the original course is managed on JZero Content Cloud and you therefore know that all users are seeing the latest version of the course. As the original course is provided to the LMS client, there is no control to stop someone from modifying original course content. The LMS is only hosting an Accelerated SCORM package which does not have any content, so no modification is possible. There is no control over someone reselling our original course to a third party. The LMS is only hosting an Accelerated SCORM package so they cannot sell original content as they do not have it. Also each Accelerated SCORM package is bound to an individual LMS, hence if that client sells the Accelerated SCORM package to another client then its usage will be calculated in the client's LMS account and they will be charged for the usage. There is no control of course usage once we provide a course to an LMS. JZero Content Cloud provides control over the Accelerated SCORM package usage and we can restrict an LMS on using Accelerated SCORM package by number of user courses. Therefore the Accelerated SCORM package cannot be launched by more than the number of users agreed. You can also see usage per client from the reporting console and get alerts as to when a client is reaching their license limit, allowing you to proactively upsell more licenses. There is no control over the LMS client regarding on time bill payment and use of content more than the contractual timeframe. JZero Content Cloud provides control over the Accelerated SCORM package and you can deactivate any Accelerated SCORM package in case of contract violation. Not able to provide other content such as Tin Can, Documents, HTML, etc. to an LMS which is only supporting SCORM content. Note: only SCORM and TINCAN are supported on the JZero Cloud content engine at present but other content types will be supported in a future release. Alleviate time consumption of managing content by hosting a single instance of your course which can then be used by any LMS that you may be managing. The Accelerated SCORM package for the course is a lightweight file which can be imported into any LMS. Once installed, all users of any LMS will launch the same physical course, therefore meaning any updates or changes to that course only has to be done once in one location. Reduce internal hosting costs by hosting all of your content in the Cloud rather than on internal servers or in your hosted LMS. Provide streamlined content management for all content authors and administrators by having a single location where content is uploaded and managed. Provide content that works from anywhere. 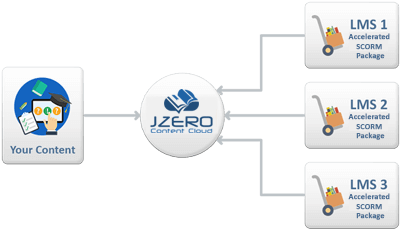 JZero Content Cloud is a new breed of content hosting which brings both content vendors and LMS owners many benefits for a very competitive price. Pricing is based on a per user course license. That means that whenever a user first launches a new course, they will consume a license. They can then launch that course as many times as they wish as the license is only used on first launch/registration. So for example, if you had 5 users who all launched 10 courses each, then you will have consumed 50 licenses or if you have 1 user who launches 3 new courses, then that is 3 licenses. Pricing is on a monthly basis based on the plan that you choose. It is important to note that if you exceed the number of licenses within any given month, then you will be charged at a higher rate for any additional licenses consumed, so calculating your usage estimates is key here. Actual pricing details will be provided nearer the time of the product launch.